Thanks to our new guest blogger Mike Clarke (Fimark.co.uk) who has given us this great article about the benefits of laser engraving over conventional benefits. Laser engraving and marking are system technologies that have evolved tremendously over the years. Attractive, permanent laser engravings of part numbers and logos are not a luxury anymore, but a necessity. Many industries need to have their products engraved to be able to track them down and keep a close eye on distribution. The inherent benefits and general value of laser marking systems that are computer aided are finally being more understood. High-quality, unique imagery and codes are a lot more readable by machines when engraved. Laser marking in particular, might have great potential benefits in the future as well. Right now, some industries that have already adopted the technology are: aerospace, firearm, jewellery, medicine, vehicle manufacturing, and more. Why is laser engraving better than conventional methods? Advanced technology has completely changed the way we look at the world. The future of laser marking, etching and engraving have a lot of potential because these laser technologies can out-stripe the quality and price of a product in a way that the market must adapt in order to live up to the competition. High precision laser engravings and laser markings can be attained on nearly any sort of material including stainless steel, platinum, copper, titanium, gold, aluminium, carbide, and brass. Even plastic and wood can benefit from timeless laser engravings. Non-contact laser marking is a process known for its high temperature and durable resistance; micro-coded laser markings have the capacity to resist in extreme heat, which basically implies that words that are attentively etched won’t degrade over time. The process doesn’t include any sort of toxic solvent use, acids or inks. Leaving aside laser engraving and laser marking, other marking methods that can be traced are hand engraving, ink jet, and dot-peen marking; these however don’t guarantee durability, and marked surfaces might fade away over time. Product engineering professionals are starting to understand that conventional marking methods don’t last. Laser engraving on the other hand, prides with outstanding quality. The engraved products feature lifetime traceability; they don’t fade away, so business can be sure that their requirements will be met. Whether you’re goal is to reach new markets, expanding your business mantra or you simply want to change goals completely, deciding on laser marking and engraving equipment with the finest capabilities is fundamental. First of all, the scanning speed of a laser is incredibly fast and precise. Characters can be processed dimensionally, and if you want you can also have images and words engraved as well. Laser engraving produces extremely precise and clean marks; the lasers used are incredibly fast and a lot more convenient than conventional product imprinting methods. This makes them versatile on a wealth of materials. 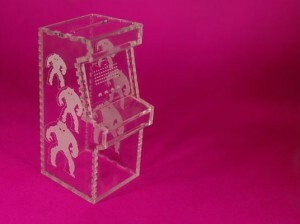 Furthermore, the exact same type of machine can handle thin materials, and also have them engraved. Original laser engraving devices used to be very large, bulky and particularly difficult to manage and maintain. However, advanced technology has change all that. Today’s laser machines are more compact, easy to operate, maintain and utilize. To begin with, lasers now come with a seal and a constant use of gas flow is no longer necessary. The engraving speeds are a lot faster and they feature more options. In terms of price, we’ve seen a significant decrease in cost, thus making laser engraving a lot more accessible to companies of all sizes and shapes. The most notable change in laser technology is the laser’s interface, which is now tech-enabled and tied to computers. Systems are connected to desktop computers through a printer cable. There’s also a machine driver included, which is installed into the computer. The artwork involved is generated onto the computer via graphic programs like CorelDraw and other similar ones. Bottom line is laser engraving comes with a wealth of benefits. Latest equipments are easy to run, learn and maintain. Furthermore, lasers are not longer heavy priced, and even small business can afford to make an investment. Rather than stick to conventional methods and watch your engravings fade away over a period of time, it’s a much better idea to go high-tech, and try out laser engravings machines to mark your products. By Michael Clark and Fimark.co.uk!